The smallest owl of the region with a maximum length of 19 - 20 cm. Could be confused with Southern White-faced Scops-Owl because both have ear tufts, but this species has a grey (not white) face and is considerably smaller and slimmer and has yellow, not orange, eyes. Both grey and brown forms occur. Typically, ot roosts on branches adjacent to a tree trunk; it is very inconsicuous by day. Bushveld and dry open woodland. Absent from forested regions. Its slight build, small feet and slender toes enable it to catch prey such as invertebrates, small rodents, reptiles like geckos and skinks, and small birds. If an individual feels threatened, it stiffens its body, compresses its feathers, erects its eartufts and closes its yellow eyes into narrow slits. 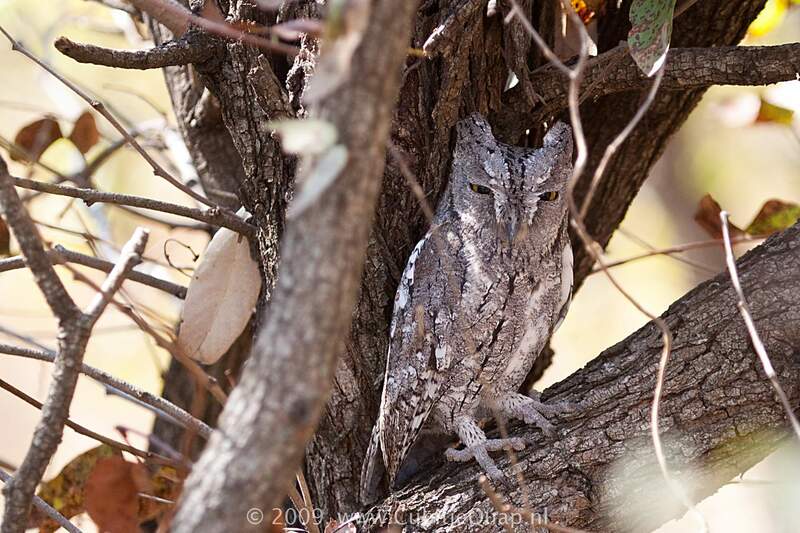 This is done to camouflage the owl and make it resemble a broken tree stump. 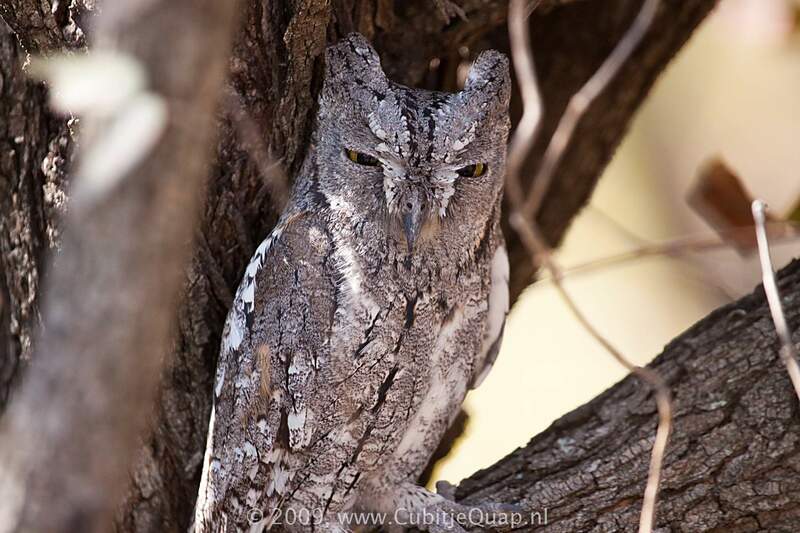 Its cryptic feather colouration assists to hide the owl against shades of the bark of the tree it is perched on. 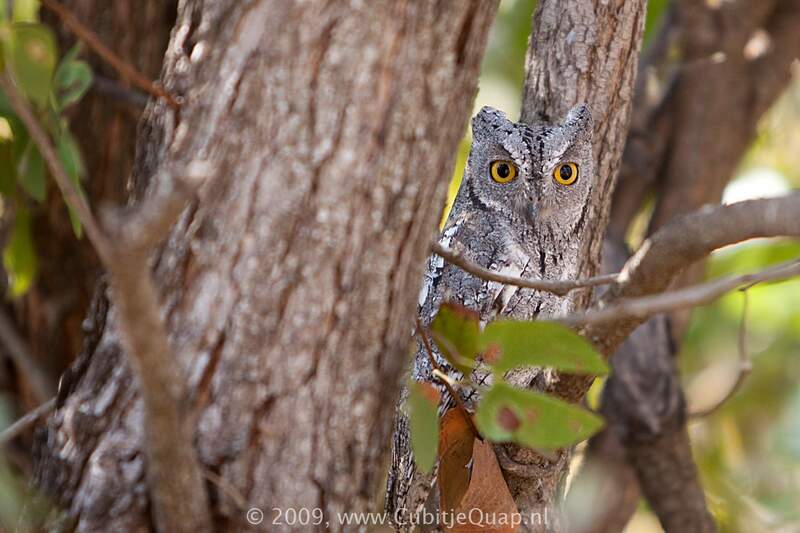 (af)rican scops owl tend to nest in holes in tree stumps or branches. it can either be a natural cavity or an old woodpecker or barbet hole. On average 2 - 4 eggs are laid between June and December with a peak in october. The female incubates the eggs for 22 days while the male provides the food. A soft, frog-like 'prrrup', repeated at regular intervals.